"The job was completed quicklyactually ahead of schedule. The results were very good quality and there were no areas that I felt required additional attention. . . . My experiences with PMC have been excellent. We now have a relationship spanning almost 20 years and I am a very particular client, so it speaks very highly of the level of service, value, and quality that PMC provides." Contact PMC principal Pat Scanlon by phone at (714) 814-9736 or email at info@pmcconstruction.com to discuss how your project can benefit from PMC's knowledge, expertise, and professionalism. References available upon request. Kitchen remodel with new granite top, new sink fixtures, and a new paint job adds elegance, style, and value to homes and investment properties. 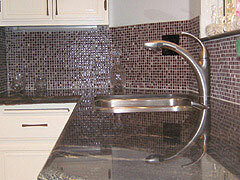 Copyright © 2010-17 by PMC Construction Inc. All Rights Reserved.